THE B-MOVIE NEWS VAULT: New DVDs & Blu-rays for 05/03/2016! New DVDs & Blu-rays for 05/03/2016! Welcome to May 2016 Vault Dwellers! 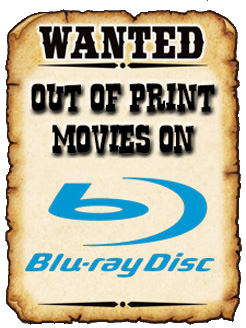 To start the month off right, here's your first dose of new DVD & Blu-ray disc news! Scream Factory starts the month off strong with a handful of indie Horror offerings, including SUBMERGED and the Jim Wynorski-directed SHARKANSAS WOMEN'S PRISON MASSACRE. (Read my review for it HERE.) Also be on the lookout for Garagehouse Pictures' TRAILER TRAUMA 2: DRIVE-IN MONSTERAMA, Kino Lorber's STEELE JUSTICE, and Criterion Collection's EASY RIDER! There's plenty of other cool stuff out today, so scroll down to see the entire list! Contains: Rise of the Undead, To Survive, Slipstream, The Devil's Messenger, Night Train to Terror, Daughter of Darkness, Zombies Vs. Strippers, The Last Man on Earth, I Eat Your Skin, and Destined to Be Ingested. Contains: Carnival of Souls, Chamber of Horrors, Last Man on Earth, White Zombies, and The Bat. Contains: Earthquake, Airport, Hindenburg, and Rollercoaster. Check out our monthly column! New DVDs & Blu-rays for 05/24/2016! New DVDs & Blu-rays for 05/17/2016! FENDER BENDER coming to Chiller TV this Summer! New DVDs & Blu-rays for 05/10/2016! Snag a new NOSFERATU print from Grey Matter Art! Relive a Bygone Era with Dude Apparel's Collection of Awesome Video Store Staff T-Shirts! STOCK YOUR VAULT: New DVDs & Blu-rays for 04/02/2019! SCREAM & SHOUT! FACTORY'S 2019 RELEASE CALENDAR! Umbrella Entertainment's April 2019 New Releases! STOCK YOUR VAULT: New DVDs & Blu-rays for 04/16/2019! SIGN UP AND GET A FREE MONTH OF AMAZON PRIME VIDEO! The B-Movie News Vault (©2015) is an appendage of www.bmoviefilmvault.com (©2000 - 2019). Powered by Blogger.